← Parabens and Breast Cancer, Read the Labels! Arugula, also known as, rocket, roquette, rugula or rucola is one of the greens we usually find in a bag of mixed baby lettuces in the organic produce section of your health food market. It looks a little like watercress, but its a member of the cruciferous family and is related to broccoli and cauliflower. From its cruciferous family roots, arugula gets its glucosinolates which have antioxidant power, as well as enzymes needed for detoxifying the body naturally. According to health coach Margie King, for greenmedinfo.com this little green has been linked to gastric ulcer relief and animal studies have suggested that arugula seeds may even help in the prevention of inflammatory skin diseases such as psoriasis. Its even been said that arugula seeds have been used since the first century A.D. as an aphrodisiac although there is no “scientific” evidence supporting this interesting claim. Arugula is high in vitamins A and K, and also folic acid. It is a good source of zinc, potassium, calcium and iron. It is my favorite green and I enjoy it alone or with other mixed salad greens and ingredients, especially avocado. Some folks like to substitute it for basil in pesto sauces and also use it instead of spinach in certain recipes. I love serving it as an elegant healthy salad with baby beets, crumbled organic lavender or honey goat cheese on top with a sprinkle of organic pine nuts or pistachio’s. You can add, black pitted olives, organic baby tomato’s, cucumber, celery, red and yellow peppers and all the other salad fixings you love. And it’s a great salad plain, just the arugula dressed with a drizzle of organic cold pressed/first pressed extra virgin olive oil and lemon juice or white balsamic vinegar and some fresh shaved parmigiano cheese on top, as dressing. I also season it all with a sprinkle of Himilayan pink crystal salt, fresh ground pepper and Herbes de Provence. If you are using a store bought gluten free pizza crust heat it at 350 degrees on a cookie sheet until lightly browned (about 10 minutes). Let cool. place a few slices of sun dried tomatoes and anchovies strategically, so each slice gets these ingredients. You can be creative and use the toppings you prefer in stead of mine and of course make vegetarian substitutions. 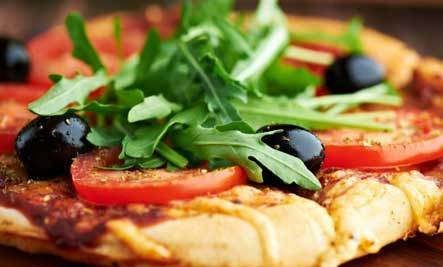 Slide on to serving platter and put a generous amount of arugula on top to create your pizza salad then drizzle with olive oil, balsamic vinegar and more parmigiano. Slice, serve and enjoy!